New statistics released by Game Workers Unite Australia (GWU Aus) from their self reported survey has found that up to one third of workers in the games industry work for less than minimum wage. 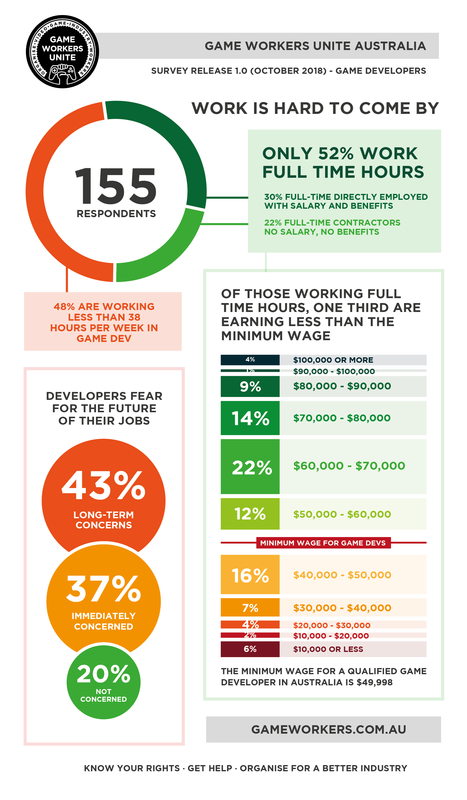 155 developers completed the survey and 35% were earning less than $49,998 with only 30% of those surveyed working in full time salaried positions. A statement from GWU Aus organisers Felicia McIntire and Tim Colwill said that game developers should be entitled to conditions under the award that many of them weren't receiving. "Our legal advice received is that game developers in Australia are covered by the wages and conditions outlined in the Professional Employees Award 2010. This guarantees a minimum of $49,998 for a qualified graduate game developer (or someone with equivalent experience)." There has been some criticism online that the statistics didn't capture the income & conditions of those 70% of game workers who are self employed or doing contract work, or otherwise not directly-employed in the games industry. "We understand this criticism and certainly in future releases we can be clearer on separating self-employed workers from the directly-employed workers if this is data that people would like to see," said Colwill & McIntire. Grae Saunders of Perth based studio King Tide Studios currently works a full time job in addition to working on his debut game Little Bit Lost and said that the statistics were concerning. "Currently my work in the game industry is that of passion. We are funding everything we do by working full time jobs with the hope that in the future we may make some money," said Saunders. The Game Developers Association of Australia (GDAA) surveyed 71 companies and released their annual findings in April this year and it found the average wage for junior team members was between $45k-$55k, with company directors earning $75-85k. Vee Pendergrast, managing director of Stirfire Studios said that game development was an aspirational career for many in the Australian game industry and that many developers would do this work on top of other employment. 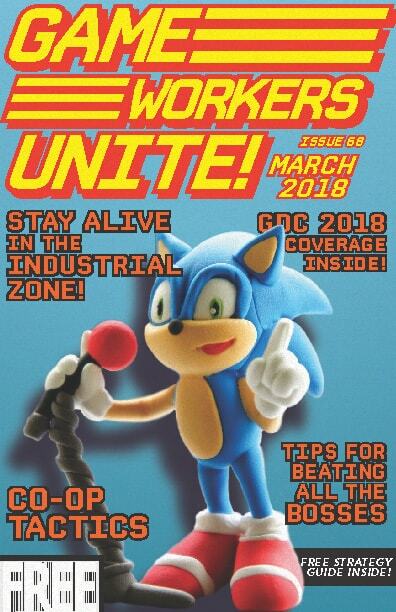 The Game Workers Unite magazine handed to GDC participants in early 2018. Melbourne International Games Week begins Saturday 20 October, where game developers from around the country gather to discuss the industry and careers.